Visions of a mechanized world flourished long before the term “automation” was coined. The star of Westinghouse’s exhibit at the 1939 World’s Fair was Electro, a robot that could walk, talk, and count on its fingers. Sadly, Electro and his kind were little more than demonstrations of remote control by human operators. By the early sixties, they had been replaced in the public imagination by something much more useful—the computer. In movies and advertisements, these “electronic brains” hummed away in orderly surroundings, watched over by well-dressed individuals who seemed to have nothing to do except gaze at the flickering lights and occasionally change a reel of tape. However, the reality was quite different. Most machine room supervisors would trade their last box of punch cards for an “Electro” who could unfailingly schedule and manage jobs, deal with unexpected events, and resolve performance problems. The same is true today—and that’s where automated operations comes in. In the mainframe computing environment, the variety of software needed to perform essential functions has always posed a challenging operations management problem. Initial solutions relied on numerous human operators, whose salaries became a significant portion of the IT budget. Operations became a monster that had to be fed constantly. Whole administrative structures were created to support it. This bureaucracy, and the nature of people, led to a system that was prone to errors— resulting in more expense and complexity. The situation was out of control and something had to be done. The answer turned out to be using the computer to control and manage itself. Automated computer operations began about 45 years ago when IBM introduced the OS/360 operating system. Like other early operating systems, OS/360 was a supervisory program that managed system resources and provided automatic transition from one job to another. This was called batch processing. OS/360 could run batch jobs, but had only limited control over their sequence and no capability to schedule future jobs. It still required a high level of operator involvement. Subsequently, IBM developed add-on components like Job Entry System 3 (JES3) that provided basic job scheduling. But, this capability remained weak in later IBM operating systems such as MVS, VM, and DOS/VE. The issues surrounding automating computer operations lie in the complexity of the various operating systems, databases, communications, and other software in use. Because each component was independent, they had to be manually integrated and controlled by the Operations staff. The continuing need for people to perform complex, labor-intensive tasks led software developers to begin developing today’s automated operations software. The number and breadth of products has grown considerably to encompass scheduling, management of console messages, backup and recovery, printing services, performance tuning, and more. Given the right tools, automating computer operations can be surprisingly easy and can reap major benefits. Understanding these benefits—and some obstacles—will help you develop support for an operations automation project. 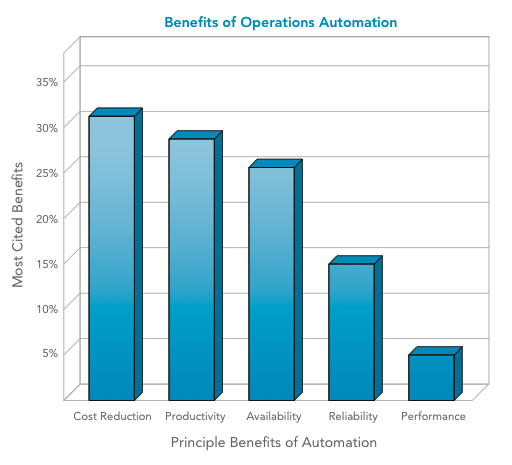 A recent study by a leading trade journal asked the question, “What do you see as the most important benefits of an automated or unattended computer center?” The primary benefits of operations automation cited most often were cost reduction, productivity, availability, reliability, and performance (see the figure below). Every business faces global pressure to increase their profitability. One approach is to reduce costs. But, reducing the capabilities of the computer center negatively impacts the entire company. Automation software is a better and more intelligent approach to cost containment and reduction. The greatest opportunity is to increase service to the customer (end user) while systematically reducing costs. Management often overlooks this potential for savings. Most modern servers have a low operating cost and the total cost of ownership has been declining. Even so, the cost of the operations staff can be as high as 71% of the total cost. As an organization’s technology demands grow, productivity becomes a bigger concern. Typically, as other business areas were given tools to increase their productivity and effectiveness, IT operations took a back seat. The proliferation of desktop productivity software has created substantial gains in the office and HR environments. But, instead of alleviating workload for the IT professionals in the back room, the spread of PCs has meant more tasks to be accomplished. As people use computers more, they place greater demands on the system. More users are generating more jobs, and printed output has increased despite efforts to reduce printed reports. In spite of the trend to online transaction-oriented and client/server systems, batch workloads continue to grow. Production batch jobs still consume the majority of CPU time, and in large shops, jobs are constantly being added. Robotic process automation is a new type of automation solution streamlining operations in businesses of all sizes. What is Robotic Process Automation? A Guide to RPA tells you what you need to know about RPA technology and how to get started. Automated operations can resolve these issues in several ways. Job scheduling software increases batch throughput by automating the production batch schedule. In the early days, computer throughput was limited by how fast operators could reset switches on the console. The solution for today is not to allow the computer to remain idle while waiting for the operator to release the next job. You save time and money by eliminating the lag time between jobs and minimizing operator intervention. In some instances, you can trim hours off your process, which lets you process more work and significantly improve system use. Once the job schedule is established, the automation software executes the commands precisely and in the correct sequence, eliminating operator errors. Forecasting job completion and being able to perform “what if” analyses of schedule changes benefits operations by removing much of the guesswork from daily tasks. Companies are continually more reliant on their computers. Day-to-day business is routinely conducted with online systems: order entry, reservations, assembly instructions, shipping orders—the list goes on. If the computer is not available, the business suffers. Years ago, it was considered acceptable to have the computer unavailable for a few hours. Today, with the high volume of cloud computing, the outage of key systems can cost millions of dollars in lost revenue and tarnish a company’s reputation. High availability is clearly one of IT management’s primary goals. Here too, automated operations can help. A disk drive may crash, but the situation becomes serious when there is not an adequate backup— or worse, the tape cannot be found. A key advantage to automation is the ability to automate your save and recovery systems to ensure protection from the potential disaster of disk loss, or inadvertent damage to system objects from human error. In a networked environment, centralized management also makes sense. Remote resources can solve business issues while a single operator at a central console observes critical functions throughout the network. Continuous monitoring with a low CPU and communications overhead makes it easier to spot vital network performance trends. Productivity is an obvious benefit of automation. However, reliability is the real gem that sparkles with automation. It is the cornerstone of any good IT operations department and without it you have confusion, chaos, and unhappy users. IT operations requires two opposed skill sets: On one hand, an operations person needs highly technical skills, such as the ability to understand the complexities of an operating system and to analyze and solve problems as they arise. On the other hand, this same person has to be content pushing buttons and loading paper. Let’s face it, off-shift operations include some of the most boring, repetitive, and error-prone tasks of an IT organization. But, when you remove the human factor, you eliminate most batch processing errors. Automated operations ensure that jobs are not forgotten or run out of sequence, that prerequisite jobs are completed successfully, that the input data is correct, and that any special processing is performed. Software can handle complex tasks dynamically and intelligently, based on predefined parameters. Yet, critical company functions such as releasing jobs, performing backups, and ensuring communications, are normally performed by entry-level individuals within the IT organization. The benefit of an automated system is that these functions are reliably executed by the automation software, relieving operations personnel from hours of tedious, boring and manual tasks. Every company would like to have their enterprise perform like a thoroughbred. In reality, it is more likely to be overburdened with work. Even though advancements in computers make them faster and less expensive every year, the demands on them always catch up and eventually exceed the level of capability that a company’s computer infrastructure possesses. That leaves a lot of companies wanting to improve their system performance. Operations automation results in higher productivity, reliability, availability, and increased performance and can reduce operating costs. Moving to lights-out operations yields a good return on investment. The benefits of automated systems can be a powerful motive for increasing service to your end users. However, it’s not an easy task. There are many pitfalls and many obstacles to overcome. Of the companies surveyed, 43% have identified and placed operations automation projects on their calendar. That means that 57% of these companies have not recognized the potential advantages of automation. Generally speaking, the obstacles to operation automation fall into two categories: cost and people. Two of the most common benefits are availability and reliability. Both of these factors are convincing arguments to proceed with automation projects, and normally supersede the need to cost-justify them. However, as projects advance, additional cost factors come into play. Additional investment in things such as automated tape librarians or automatic cartridge loaders, additional software, and messaging services may be required. The companies that implement automated systems early often see positive bottom line results from their efforts. However, cost savings are not the primary reason to automate computer operations. The focus should be on improving service to the end users. As the quality of this service improves with automation software, the costs associated with it also improve. In-house automation solutions are often successful at first, but the scope is usually too narrow. Systems often fail because of the maintenance and enhancements required to maintain and expand the automation process. And, in-house automation solutions are expensive and typically are low priority in the IT department. This is why most internally developed automation efforts stall after achieving limited success. Many companies that have gone down this path eventually turn to off-the-shelf automation software. Some personnel issues have surfaced as automation becomes reality. Many system operators view automation as a direct threat to their livelihood. Not having a strategy for handling staff concerns and managing staff participation is one of the easiest ways to fail at implementing automation. Computer operators who feel their jobs are in jeopardy can always find ways to defeat the testing, evaluation, and implementation of new automation software. Analysts see report automation tools as a threat. Plus, operation supervisors see staff reduction as a direct threat to their position and status. No company wants to have a reputation for firing employees, or to have an environment of low morale and trepidation. However, some companies are changing so quickly today that attrition alone is not a viable solution. The answer is to modify the role of the computer operator. Give your operations personnel new responsibilities, such as operations analyst, networking technician, or PC administrator. As the old positions are no longer needed, the new technology gives rise to new and greater responsibilities. Companies need to realize this and maximize the talent they already have. From management’s perspective, reliability, availability, productivity, performance, and cost reduction are powerful arguments for adopting an operations automation solution. However, achieving these benefits requires discipline to overcome the obstacles. As long as you understand, anticipate, and balance these obstacles against the potential benefits of automation, they should not interrupt your plans. The Automate suite of products is a top-rated suite of automated operations software. Learn more by clicking on one of the products below, or start your free trial today. Automate: RPA Software provides easily configurable robots for desktop automation. Automate Enterprise: A scalable business process automation software for comprehensive enterprise automation. Automate Schedule: Provides powerful workload automation for centralized job scheduling. Automate streamlines IT and business operations by automating tasks and workflows without requiring you to write code. Try it free for 30 days.